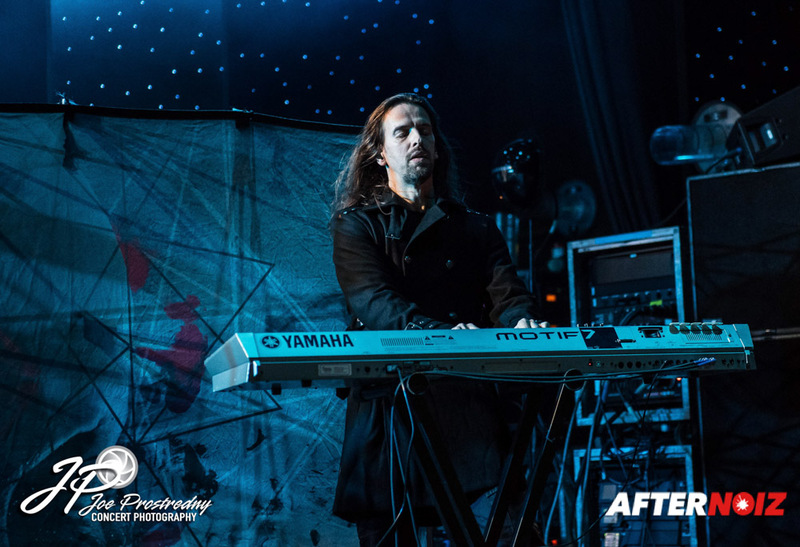 This is Joe Prostredny with Afternoiz and I’m here with Tuomas from Nightwish! Thank you very much for talking with us today! So, we’re here in Silver Spring, Maryland, May 14, and it’s the last day of the North American tour! How has the tour been going so far? Tuomas: We were just talking about this tour with the band mates. This has to be the most relaxed leg we’ve ever done. The organization has been so good, the road tour, the tour manager. It’s been so smooth, so easy. The fans have been fantastic. All the shows have been really good, some even superb. So, absolutely, no complaints. Good! Is anything special planned for tonight, this being the last show, or…? I guess we’ll see tonight. This is you first tour since the release of the new album, “Endless Forms Most Beautiful”. Have you gotten much feedback from the fans regarding the new album and the new songs? 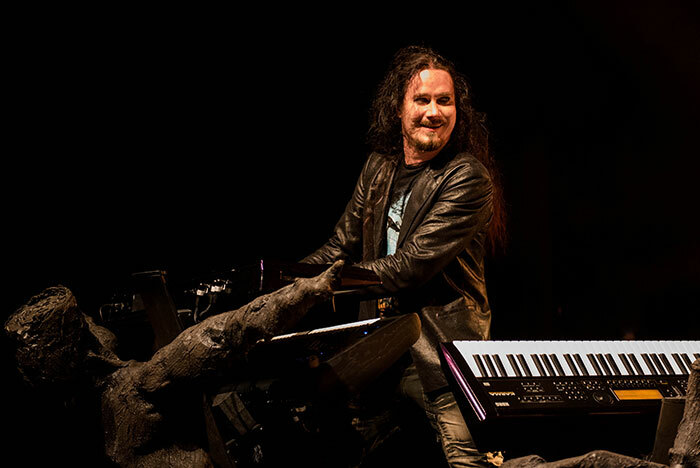 Tuomas: Well, yeah, and it’s mainly been really, really positive. We didn’t really expect that. Well, of course everybody brings up Floor, and they seem to be really happy with her performance. Also, Kai Hahto, the replacement drummer has been doing a fantastic job, and people seem to be really interested in the schematics of the album. They seem to appreciate the idea of a scientific approach to this album, so mainly just positive. Some people got a little upset about Richard Dawkins (an evolutionary biologist) being on the album but other than that it’s been just incredibly positive! With all the great songs on the new album, how did you choose which ones you would perform on this tour? Tuomas: Well, the ones that just feel like the perfect live songs; the ones that we enjoy playing the most. We actually rehearsed almost all the songs on the album; we are changing the set list quite a bit. So, some songs just work and those we like to play. We even dropped out “Nemo”, which is kind of like our biggest hit. Yeah I noticed, I saw you in L.A. and Phoenix and you didn’t play it at either of those venues. Tuomas: Right. It just felt like a necessary evil so to say. Why do we play this when nobody feels this song anymore, so let’s just give it some space and bring it back at some other tour. You’ve been playing a lot of other great older songs on the tour. Floor has pointed out that “Stargazer” is back in the set list after 10 years. Of all the songs in your back catalog, what made you bring that specific one back? Tuomas: Actually, we talked about which songs to bring back with Floor; which ones she would feel most comfortable with. And “Stargazer” was the immediate choice and “Sleeping Sun” as well, because that’s one of her all time favorites. So, those two for now. In the future there might be something else coming up as well. Any favorite memories from the tour that you’d be willing to share with us? Tuomas: I think the highlight of the whole tour was the Greek Theater show in L.A. because of the surroundings, and because of the audience. Because my mother was there, it was just a really, really magical evening. I shot that show. I was down in the photo pit. It’s a great venue! Tuomas: It’s so beautiful, really inspiring to see all those trees lighted up from the stage and all that. Truly magical. Speaking of magical… “There is grandeur in this view of life, with its several powers, having been originally breathed into a few forms or into one; and that, whilst this planet has gone cycling on according to the fixed law of gravity, from so simple a beginning endless forms most beautiful and most wonderful have been, and are being, evolved.” That is the final sentence from “On the Origin of The Species” by Charles Darwin and it’s also on the album. The entire album seems to be a tribute and celebration of the wonder, the joy, and the history of life. Nightwish albums have always been a grand fantasy trip, and this one is as well. But this one is also very grounded in the reality of biological science and evolution. Where did that inspiration come from? Tuomas: It’s always been there, I mean, I’ve always been fascinated about natural sciences, especially biology. My biggest heroes since I was a kid include persons like Carl Sagan, Charles Darwin, and then some recent finds like Richard Dawkins, for example. So a few years ago I just (laughs) went deep into that stuff and started reading a lot of books. Then I saw the “Cosmos” series, first the original Carl Sagan one, then the remake with Neil deGrasse Tyson and it made a huge impact on me. And I just started to feel that this is the stuff that Nightwish needs to do now. We have never really explored this end of the spectrum. Nightwish has always been more about personal stories out of my own diary or something fantastic, which is beautiful, but it just felt like the right time to do it. Well I thought the album was a very stunning creation! You know Darwin never mentioned the term “evolution” anywhere in his book. The term “evolved” is only the last word. He kind of circled around it, said divergent development and phrases like that. Nobody is 100% sure why he did that. They presumed that the word was so controversial back then that he was almost afraid to use it. Tuomas: Because of his wife as well. Yeah? Well, even today, with all scientific proof in front of us, so many people deny evolution. And you can’t completely blame religion because the Catholic Church, which is the biggest Christian organization in the world, embraces evolution. Why do you think there is so much resistance in the world? Why do people deny the evidence that is right in front of them… all around them? Tuomas: I think some people find the idea that we all share the same common ancestor somehow diminishing to the human species. I think it has to do with human arrogance, to put it simply. We think we are above all other creation because we have a really evolved brain. We’re not, we’re all cousins, and to me that’s the most beautiful and humbling fact that there is. But I think for the evolution deniers it has something to do with the fact that they wouldn’t feel superior anymore if they accepted it. I mean the fact is that if you don’t believe in evolution… it’s not even a matter of belief, it’s a scientific fact. The evidence is so overwhelming. So if you don’t believe in evolution, you’re either uneducated or… nuts. I totally agree. The phrase I’ve heard is purposeful ignorance. The album’s magnum opus, “The Greatest Show on Earth”, is also the title of a book by the famed evolutionary biologist who you mentioned previously, Richard Dawkins. Is the song a tribute to his work or is it just similar subject matter that led you to call it that? Tuomas: Well, it’s inspired by the book of the same name and I thought there is no better title to tell the story of evolution on planet Earth than “The Greatest Show on Earth”. I thought he wouldn’t mind (laughs). Then when I met him I asked “Is it ok that I use this?” and he said “Absolutely, yeah, go ahead”. You even had him do narration on the album, which I thought was a really cool idea, by the way! But he had never heard of you before. What was his reaction to the album? Did he actually listen to it? 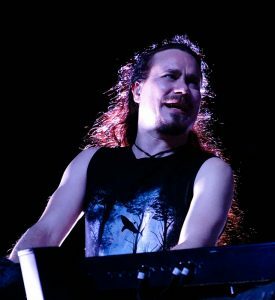 Tuomas: I met him in London a few months ago and I had a chance to play him this song, “The Greatest Show on Earth”. He listened to it through earphones and sincerely seemed to like it. He said “Yeah, this is really good stuff, but I need to go deeper into this black hole”, so that’s it. But I think he was sincere that he really enjoyed it. This is you first studio album with the new vocalist Floor Jansen. Floor is well known in music circles for her powerful voice and her diversity of singing styles and I’ve personally been a fan of hers for years. She has done a lot of operatic type vocals in the past. Because of that, a lot of people were expecting a more operatic album, similar to Nightwish’s earlier days. A lot of people were surprised that you didn’t take more advantage of that. But what surprised me, because I hadn’t heard Floor live before, was just how powerful her voice is when she is singing soft lyrics! There are tremendous examples of this on the album. And I just loved it! I just floated away on that voice. Did you know she could do that?… was that planned? Or did it just kind of evolve with the songs as the songs were created? Tuomas: Well, we knew that she is such an astounding singer but I don’t think I’ve ever heard her sing in a really ethereal way, a really soft way. So I wanted to explore that and Floor was really intrigued about the idea, you know, “I’ve never done this kind of singing”, like she does in ReVamp for example. So it was a lovely challenge and turned out to be just fantastic. And when it comes to the lack of operatic vocals that was a common decision. We all agreed that is just doesn’t sound right to our ears so why use it. Never do stuff just because you can. The first track, “Shudder before the Beautiful”, we tried operatic vocals for that one and it just sounded horrible. Well, not horrible, that’s [the wrong word]… it sounded wrong, it didn’t tell the story. “Our Decades in the Sun”… I mean the album is new and this may change, but that’s my favorite song on the album. I just love the way her vocals sound on that song. Tuomas: It’s an incredible song, it really is… and the subject matter. I’m a parent, so that speaks to me too. Tuomas: We haven’t dared to play that song live yet but at some point we definitely will. It’s gonna be hard (laughs). Well. I hope I’m at that show when you do! Nightwish’s music is always very rich and complex; so many layers. Between the band itself, the choir, the orchestra, the percussion sections, how many musicians do you estimate actually contributed to the making of this album? Tuomas: With this album, I think it was about 120. Tuomas: Yes! I find the idea that you cannot do everything yet with computers and keyboards. That you actually need to have a real choir and real orchestras to make it sound like that. I think you can tell. Tuomas: You can tell the difference. You did the album and the tour without your long time drummer, Jukka. Kai has stepped in on both the album and the tour due to some health issues that Jukka was having. Now, we haven’t heard much since his departure, how is he doing? Tuomas: He’s doing much better. He visited us in New York for the beginning of this tour. He’s doing much better but still struggling with insomnia. It’s not a new thing; it started in 2004 already, so it’s been going on for more than ten years. We just decided that we’d do this whole tour with Kai and then give it a little breather and let’s see in 2017 how he feels. But he is very much a member of the band, still. I know on the website he is still listed as your primary drummer. On your website, if I’m understanding it correctly, it looks like he may be joining you at Rock in Rio in the fall? Tuomas: Yes, he will! Just to play one or two songs. Well, the fans… they’re gonna love that. Tuomas: Well, Jukka will love it! (laughs). 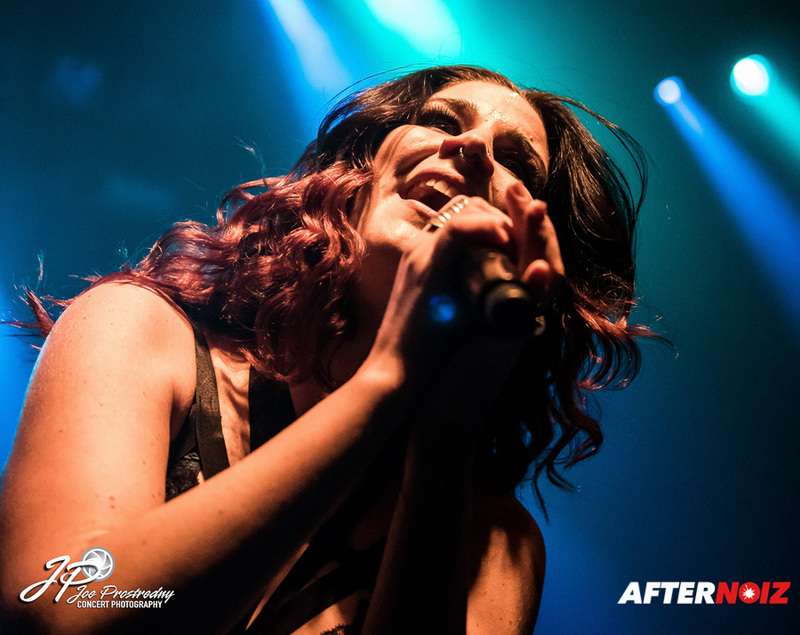 Now, in June, you’ll be doing the first ever Nightwish fan cruise. What can you tell us about that? I’ve just seen a little bit about it on the internet. Tuomas: (laughs) Well, the idea didn’t come from us; it came from the ship company. They have done similar things with a couple of other Finnish bands… and also with Sabaton, I think… and they were great successes so we thought, why not? I mean, if I was a fan of a certain band I would love to go on a cruise which is like, themed after the band, to see a show and just be there. I thought it was a wonderful idea. It sounded really cool. Is that something you’d do again? Or just see how this goes? Is it a one-off? Tuomas: Not definitely a one-off, we’ll just see how it goes first. You have your European headlining tour toward the end of the year. 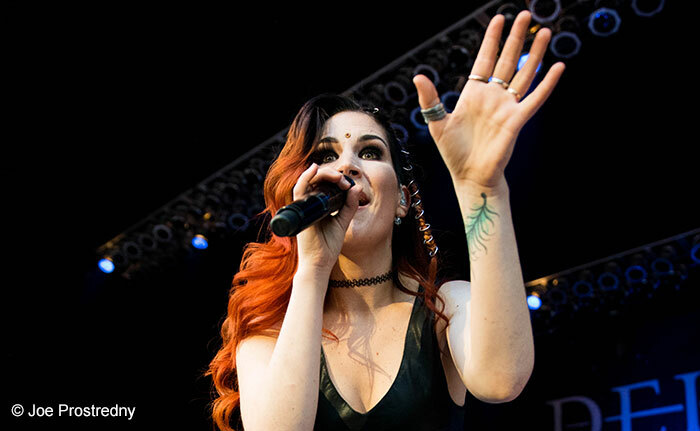 What are the band’s plans for 2016? Tuomas: 2016. First Australia, then there might be, uh, actually… yes… there is another U.S. leg coming. Tuomas: Yeah, during the first half of 2016. Then another festival season, then something in the fall then that’s it. I think we should be done by November 2016. And do you jump right back in the studio? Tuomas: I think we’re gonna take some time off after that actually, but we just made a five year plan with the band, so we pretty much know exactly what’s gonna happen until 2020. So interesting things coming up, that much I can say. We’ll be hanging around to find it out! Something else I have to ask… You keep a wine bottle holstered under your keyboards during the live shows, and I’ve seen the fluid level in that wine bottle really drop (laughs). Is that really wine, or is that water in the bottle? 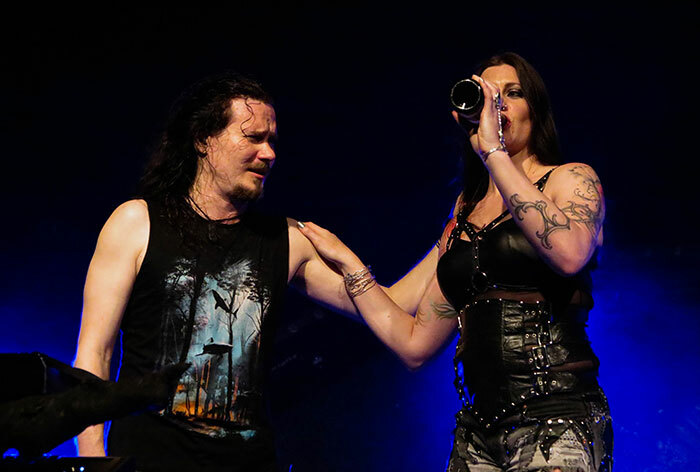 Tuomas: It’s wine. Throughout the years, it’s become my thing. Because I’m not a beer drinker. I’m not either, but I love wine! Tuomas: I absolutely adore wine, and I know it’s a bit rough to drink it straight out of the bottle… but it’s just become a habit and it’s kind of my thing on stage. Well, it’s cool, and fans look for it. I just wondered. Tuomas: I never drink before the show and I’ve kind of learned how to do it throughout the set list so that I don’t get too hammered (laughs). (Laughs) Well, Tuomas, we’d like to thank you for taking the time to talk with us today! Is there anything you’d like to say to your fans before we leave you? Tuomas: Thank you for the loyalty. I mean, it’s been nineteen years now and lots of ups, lots of downs. Seeing the reaction from the audience on this tour; more fanatic and more passionate than ever and I think the band is doing better than ever before and the fans are still there. So a huge thank you for that! Thank you very much for your music, it’s awesome and I hope it’s around for years to come! Tuomas: Sure hope so! Thank you! Tuomas: Kiitos! It was a lovely chat! 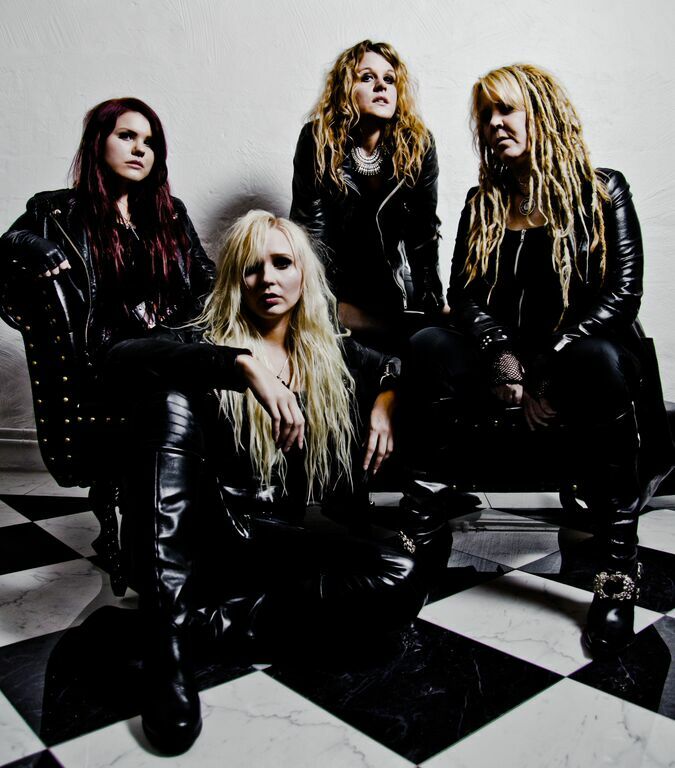 “All In” with Hysterica: An interview with Sweden’s Metal Warriors!